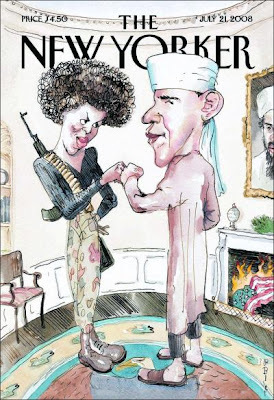 America is in a tizzy over this week’s New Yorker cover depicting Barack Obama and his wife, Michelle, as a pair of rabid radicals. The press and blogosphere have a lot to say about it too (read New Yorker editor David Remnick’s response here, in an interview with The Huffington Post). 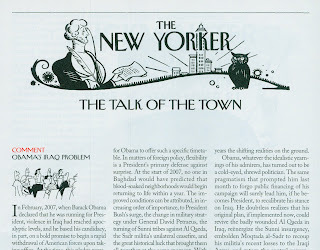 The Obama cover is a political detour on my original plan to share with you the ways this weekly magazine captures a quintessential New York flavour. It flaunts its intellectual prowess in some of the best (albeit very long-form) journalism in the country. It’s relentless (how on earth do they put one of these out every week? I can’t even find the time to clear them away from my coffee table). It has good looks AND brains (witness the parade of provocative covers, below), and provides weekly fodder for the chattering classes, as well as a litmus test for intellectuals on the dating circuit. 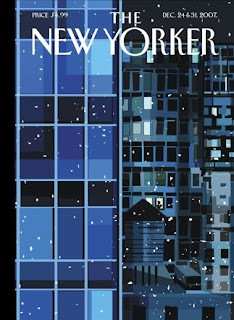 The New Yorker is not the kind of magazine you flip through. It’s a magazine you actually read. I discovered this for the first time when I moved here seven years ago. Leafing through a copy to kill some time, I was utterly disappointed. Where were the pictures? The glossy ads? It felt like some vision of olde New York where men wore seersucker suits and bow ties (actually, some men here still do). The magazine’s dandyish monocled mascot, Eustace Tilley, only reinforced this idea. He appears every week at the top of the ‘Talk of the Town’ section – a round-up of the week’s news. Every now and again Eustace’s iconic image appears on the cover (this one is by Irvin Rea). 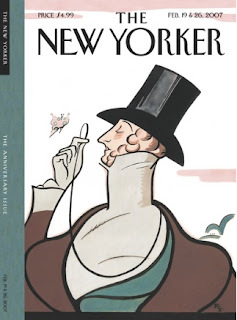 Tradition seems to be the New Yorker‘s backbone, but it isn’t afraid of reinvention – as in these contemporary takes on Eustace. Reading the magazine is like getting an informal education, thanks to articles about subjects such as contemporary architecture in Beijing and Danish efforts to cut carbon emissions. 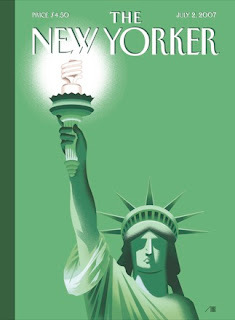 Bright Idea by Bob Staake (above) trumpets the growing popularity of energy-saving lightbulbs. I love the abstract pattern of this Urban Landscape by Kim DeMarco (above), humanised by the lone figure in the centre reading at an illuminated window. 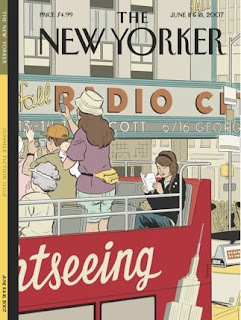 Big City Thrills by Adrian Tomine (above) shows another reader oblivious to the world around her … I think I’m getting the hint. 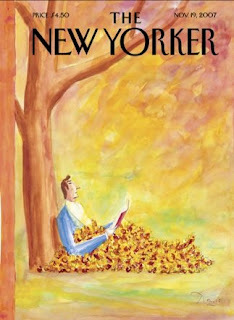 Autumn Tales by Benoit van Innes (above) – wow, how many magazines do you know of that can depict the act of reading in so many creative ways? 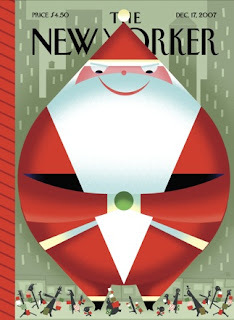 Santa’s Little Schleppers by Bob Staake (above) – only a magazine published in New York could use a familiar Yiddish-ism to describe a Christmas scene. It’s famous for its cartoons of course – and its my personal opinion that you should be wary of anyone who doesn’t admit to reading the cartoons first. 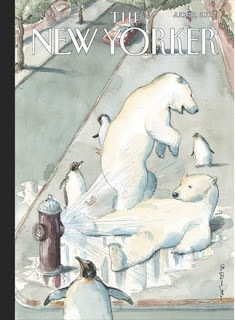 The New Yorker website has a number of very entertaining online-only features – like the Cartoon Lounge, where its cartoonists chuck around funny ideas and crazy notions. You can listen to the writers talking about their features and how they went about reporting their stories, and watch videos from this year’s New Yorker Conference (featuring people like author Malcolm Gladwell and Thelma Golden, director of the Studio Museum in Harlem) and the New Yorker Festival, where artists such as Icelandic band Sigur Ros and Salman Rushdie discuss their work. There are also loads of fabulous slide shows, including a portfolio of images from the Buckminster Fuller exhibit at the Whitney Museum of Modern art and the recent retrospective of Martin Puryear at MoMA. 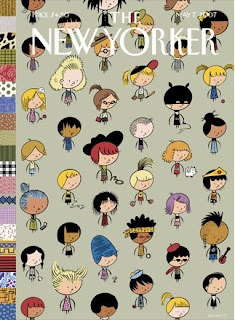 Mostly what I enjoy about the New Yorker is its use of diverse talents – the tremendous pool of creative energy concentrated in this tiny sliver of an island – to depict a broad range of human experience, as in this cover, Style Sheet by Ivan Brunetti (above), one of my personal favorites. ngs on design from New York next week, Wednesday!